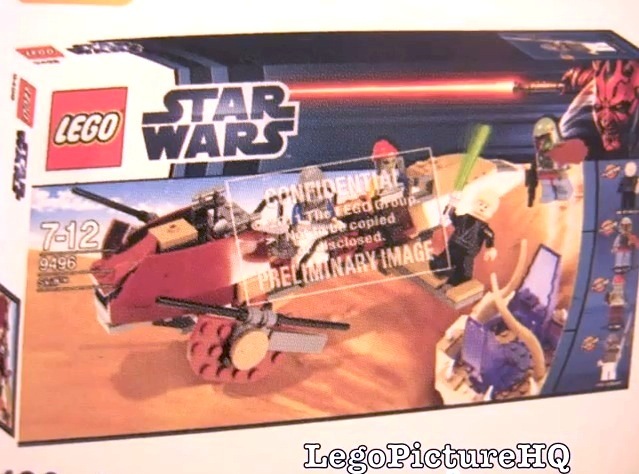 Upcoming: New LEGO Jabba’s Palace and Skiff on the Way for 2012? This is very interesting news! 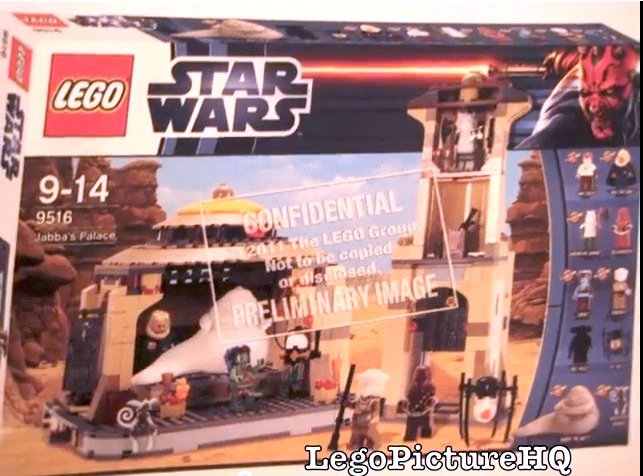 Karnorjax over on the Rebelscum forums pointed me toward this YouTube video that appears to show images of upcoming, as-yet-unannounced LEGO sets on their way for Summer 2012, including a brand new Jabba’s Palace set! The video is just a series of still images, so I’ve reproduced the two Jabba-related ones here in as high a resolution as I could manage. As you can see, the Jabba’s Palace set appears to consist of a new throne room area and a tower of some kind, along with a number of brand new minifigures. Most exciting are the new Jabba and Salacious Crumb. They’re shown in white on this mockup packaging, but it’s clear that the Jabba is totally different from before, and we’ve never had a Salacious Crumb minifig. Also very welcome are the new Oola, Boushh and “Prisoner” Chewbacca figures. Of course these are just preliminary image, so I expect some things to change by the time these hit store shelves. The figures shown on the right side of the box are a little hard to make out, and use some mockup images (for some reason Oola here appears to be represented by an Aayla Secura figure, the Chewbacca appears to be all red, and there is one figure that is just a black silhouette but appears to be using a Pirates of the Caribbean Maccus figure as a stand-in). But my guess is that they are (from top to bottom, left to right): Han Solo, Bib Fortuna, Gamorrean Guard, Prisoner Chewbacca, Oola, Boushh, ??? (mystery silhouette), B’omarr Monk, Jabba and Salacious Crumb. There also appears to be a Han in Carbonite. My first reaction is that this looks more promising than the original LEGO Jabba’s Palace — especially the throne room part. I really like the looks of it. Let’s keep our fingers crossed that they’ll finally make a rancor pit as well! The skiff is slightly less exciting, if only because we’ve already had two different skiffs (one that was released individually and one that came with the Sail Barge set). Still, it looks to be different from either of these and best of all, it appears to come with a Barada minifigure. The other figures (Jedi Luke, Boba Fett and Skiff Lando) have all been released before, but hopefully these are new versions. It also comes with a sarlacc that is different from the one that came with the Sail Barge, so it’s definitely a must-have for me. I’m looking forward to finally getting some new Jabba LEGOs! So my biggest hope is boba has an ESB deco’ on the jetpack,,,, hopeful but doubtful..
love the palace cant wait to get that..
Ha, this looks like a very nice set.